This entry was posted in LitHacker Musings, Young Adult Fiction and tagged '80s, Alternative, Nostalgia by lithacker. Bookmark the permalink. Good grief, that picture of the girls with the gravity-defying bangs takes me back to when I first moved to the Boston area (1987). Nobody in my home college town in Ohio wore their hair like that! I never got around to reading Weetzie Bat because I thought I was too grown up for it at the time (ha, how things change 🙂 and because back then “YA” to me meant Paul Zindel, ME Kerr, Virginia Hamilton, and some other writers whose contemporary novels left me feeling icky and uncomfortable, so I tended to avoid that library shelf. I’ve always regretted missing it when it was new (and I still haven’t read it, although I’ve flipped through it a few times). Maybe one of these days. I had those bangs, Holly! It was not good. okay, I got confused because of the collage picture, lol…. I was expecting the pink smog cover, I need to focus more. But anyways, I loved your review. The whole enchantment of being a 12 year old and having your eyes opened to new possibilities by a book is something I can relate to too. It makes me wish I could have read the Weetzie books when I was about that age, seeing the magic of the world through Weetzie’s eyes. You captured that feeling perfectly. So going into Pink Smog, I wasn’t nearly as expectant. I was satisfied, it was enjoyable and I think few parts actually really got me, but it never disillusioned me because I don’t think I was ever able to experience Weetzie like the way you describe. That being said, I understand your reason for being wary of revisiting the original Weetzie books, I had similar experience with Ella Enchanted when I started rereading it when I was 18 (it was the first time I had picked it up in 2 years) and started feeling myself actually criticizing it and cringing at it, and I just had to put the book down. I had reread that book so many times since the first time I had read it hen I was 9, and never had that kind of reaction before. My heart broke a little, and now I’m terrified to try again. Now, when I feel nostalgic for it, I just try to remember how I felt when first reading, and all the doors it opened for me, but I don’t know if I’ll read it again. That’s funny Sarah, because I read Ella Enchanted in my early 30s and I was thoroughly, well, enchanted. But I often find that one’s experience with a book does not remain static. I’ve gone back and forth on whether I hate, love or am indifferent to Catcher in the Rye. On other books I’ve gone from fiery hate (Old Man and the Sea; 1984) to repeated readings because I like it so much. And of course, I’ve had the opposite experience (I was enraptured by Tom Robbins books in college, now I find them tiresome). But I think the stakes are higher when it’s a book you have a deep emotional connection to, when the book is more like a treasured friend that an intellectual enjoyment. 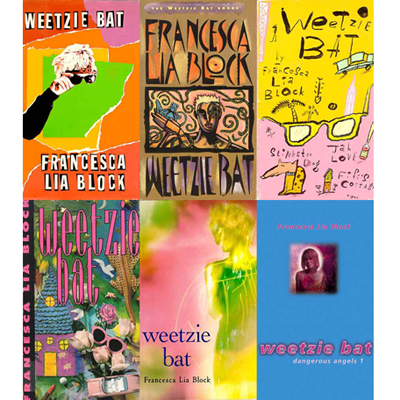 Yep, I too read Weetzie Bat as a tween (wow, decades ago now). We’d just moved from urban to country and it was very timely. I remember the sensation that I’d never read another book quite like it before. The grunge and the dirt mixed with glitter and gold. Loved it.